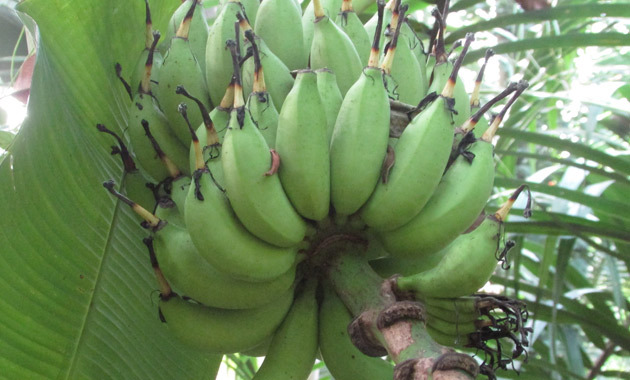 Scientific name of Banana tree: Musa paradisiaca Linn. It is a large herb, grow up to 9 m in tall, found in tropical areas the leaves are dark green, leaf blade is about 1.5 m and oblong, sheaths tubular, forming a thick watery trunk. The cone is heart shaped, maroon in color develop from the heart of the plant and, it grows as large hanging cluster (bunch) is developed as fruit, which is leathery, oblong, fleshy and when it ripe color change green to yellow and fragrant. For the medicinal purpose and in Hindu poojas, commonly used variety is Kadalyppazham, the other names are Bhagavan Kadaly and Pooja Kadaly.